I am not here to slate mainstream deodorants and harp on about the dangers of aluminium. That debate has been done to death online and I’m still not sure which side I come down on. But if, like me, you prefer your cosmetics clean and natural then the chances are you prefer natural deodorants. And that I do have an opinion on. Firstly, you are never going to get the sort of sweat fighting power you are used to from an antiperspirant when you switch to a natural one. 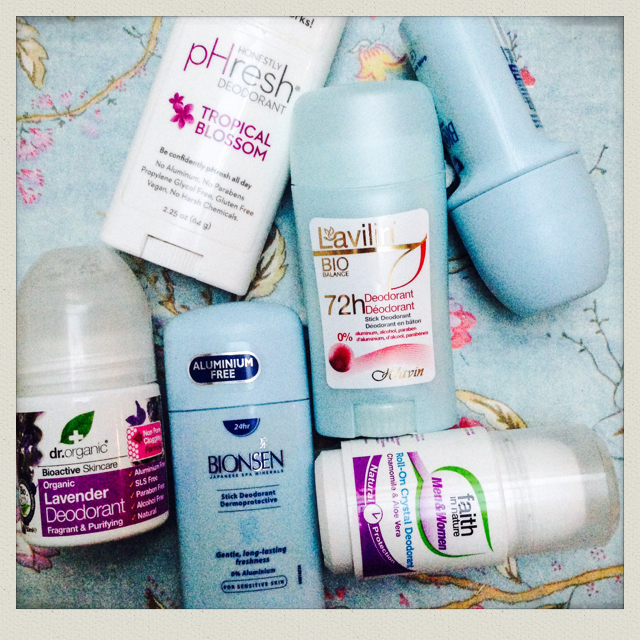 Natural deodorants are designed to let you sweat (and thus excrete toxins from your body). They work by deodorising the bacteria that cause what we recognise as BO. Secondly, when you stop using antiperspirants your body will need a bit of time to adjust so it is worth persevering for a few weeks. Thirdly, and this is important, I’ve found that with most natural deodorants you will need to reapply throughout the day. And the frequency will depend on the season, your activity levels and your natural propensity to sweat. Eugh. Free from alcohol, aluminium, parabens and all that jazz this popular natural deodorant was a must to test. Not everyone will get on with the fragrance, which is quite floral and overpowering, but in terms of BO neutralising this product is the business. I wasn’t expecting the 72 hours of odour free protection it promises but it still did an outstanding job holding up to a day’s work and commute, without the need to reapply. Unfortunately this one is the priciest of those I reviewed and costs £8.74 from Revital. But it’s totally worth the cash and I will definitely be trying more from this range. This deodorant’s performance was great and I loved the scent but it leaves white marks everywhere. I thought I could live with them but I’ve decided I can’t, which is a shame. A good one for the gym but avoid wearing black…I bought mine at a local health store for about £6.00 but the cheapest I can find online is £5.39 from Apollo Active. If you don’t fancy Tropical Blossom there’s a good choice of different fragrances too, all of which are naturally derived. The lavender scent attracted me to this but it’s useless. If you really fancy testing it out for yourself it’s available from Holland & Barrett for £5.49. I had planned to put this at the top as one of the most effective natural deodorants I’ve ever used but in researching this blog post I discovered that the stick version contains triclosan, an ingredient I try to avoid (it scores a massive 10 on the ThinkDirty app which rates toxicity and has been in the press recently with links to mouse liver cancers. For more information visit the NHS website, who comment on the research). Disappointing and proof that even a seasoned natural beauty blogger can be caught out by a bit of ‘greenwashing’. Thanks, I’m so pleased you enjoyed it. I agree it does depend on the person too…my mum and I sometimes disagree on the effectiveness of different natural deodorants. It’s a bit trial and error!